This love story is sweet. Actually, it slides over into saccharin. it's just too sweet, too simple and shallow, for me. Matt and Katie are in love ... until one day Matt just leaves. A few days later he drops off on her front porch a journal for Katie to read. Through this journal, written by his former wife Suzanne, to their son Nicholas, we learn all about Matt's life before Katie; all the experiences he couldn’t tell her and could barely tell himself. 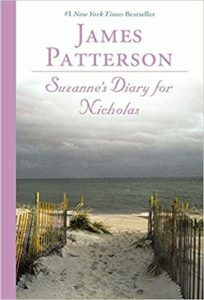 This is Suzanne's Diary for Nicholas. If you want to distract yourself for an afternoon and an evening sitting by a campfire, go ahead and read it. If you want to engage your brain in something stimulating, pick another book. This cannot REALLY be the same James Patterson, can it? Yes, it is one and the same. I guess he has a split personality. Don’t bother with this one.